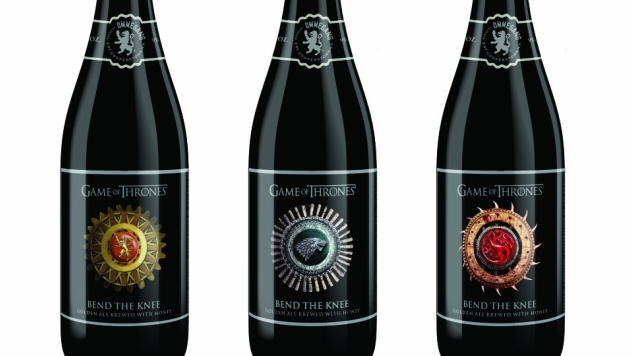 Attention Westeros-loving beer connoisseurs: Brewery Ommegang is sending another Game of Thrones-inspired ale your way in the form of the limited-edition Bend the Knee Golden Ale. With this next Game of Thrones-inspired release, we wanted a beer and a pack that was fit for a king … or a queen. Drawing from a rich Belgian brewing tradition, Golden Strong Ales are deceptive due to their unique combination of extreme drinkability and relatively high alcohol content. Bend the Knee walks that line, while also incorporating the delicate flavors of honey into the mix. The subtle noble and floral hop contribution adds to its delicateness, and the beer finishes smooth and dry. Brewed with flaked oats and pils malt, “Bend the Knee” is hopped with Saaz, Bravo and Sytrian Golding hops. Ommegang says the wildflower honey added to the golden-hued ale “provides light sweetness to the beer, which finishes dry and with firm hop bitterness.” The brewery suggests a pairing with anything from seafood to steaks to aged Swiss-style cheeses. You can check out our review of Ommegang’s Three-Eyed Raven beer here, or our review of their Valar Morgulis beer here. Game of Thrones itself is scheduled to premiere sometime this summer. Be sure to stay tuned to Paste to find out the precise date as soon as it’s announced.